The Triangulum Galaxy (M33) is a spiral galaxy in the constellation Triangulum, that is believed to be a satellite of the Andromeda Galaxy. Messier 33 can be seen visually with the naked eye under exceptionally good seeing conditions with no light pollution. The Triangulum Galaxy is a spectacular sight when photographed through a telescope. Its large, colorful spiral formation has been well-photographed by amateur astrophotographers using a camera and telescope. This galaxy lies 3 million light-years from Earth and is the third-largest member of the Local Group of Galaxies behind the Milky Way and Andromeda. Through astrophotography, we can reveal the faint details and structure of the Triangulum Galaxy with long exposure images. With enough time, your camera has the power to uncover the beauty of M33 even under an urban backyard sky. For example, the photo below showcases the M33 Galaxy captured using an Explore Scientific ED80 telescope, and a modified DSLR camera. 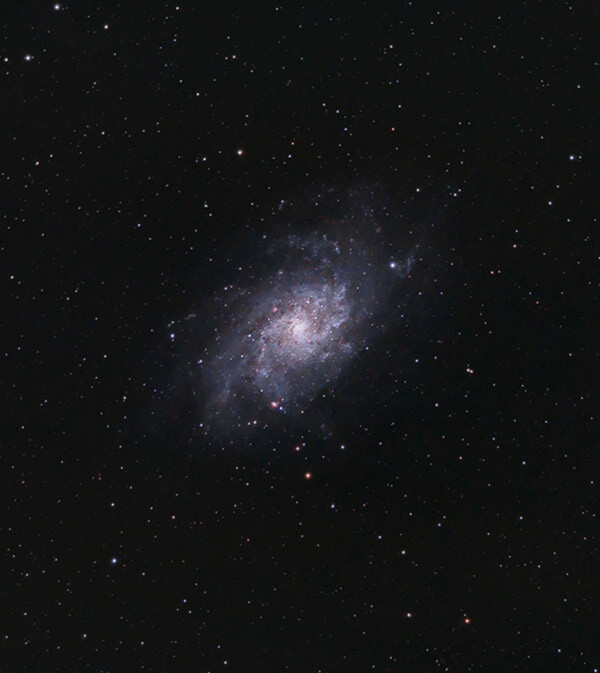 The Triangulum galaxy can be a challenging deep sky target from the city, but with plenty of integrated exposure time, the true beauty of M33 can shine through. The Triangulum Galaxy was independently discovered by Charles Messier in 1764 and was later published as object number 33 in his Catalog of Nebulae and Star Clusters. Although the presence of M33 becomes obvious in a long exposure photograph, it can be difficult to observe visually. This face-on galaxy has been referred to as the Pinwheel Galaxy in some amateur astronomy references, but I prefer to reserve that title for Messier 101. It is a diffuse object, that can easily get lost in a small amount of light pollution. 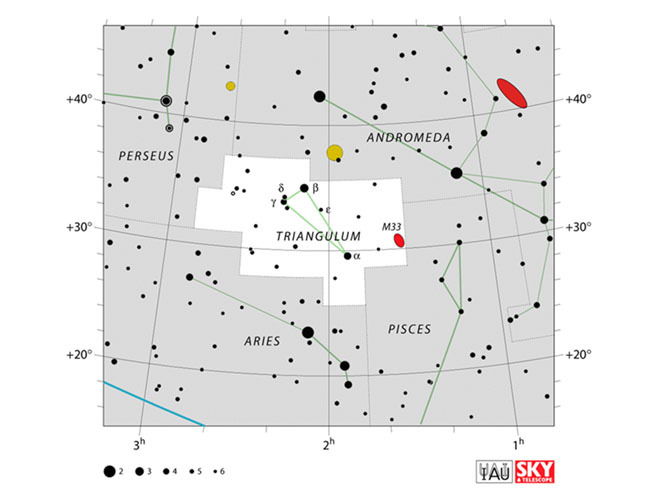 In fact, the Triangulum Galaxy is one of the critical sky marks of the Bortle Dark-Sky Scale. I find it very interesting to note that the galaxy’s brightest region of hydrogen (emission nebula), has its own designation of NGC 604. It’s another cataloged deep sky nebula within the galaxy itself! Have a look at this exquisite example of NGC 604 within the Triangulum Galaxy captured by an amateur astrophotographer. A C14 Edge telescope was used to produce this HaLRGB image. The giant H-II regions found in Messier 33 are some of the largest known stellar nurseries in the Universe. NGC 604 is over 40 times the size of the visible portion of the Orion Nebula. H II regions are full of atomic hydrogen that is ionized and indicates an area where star formation is taking place. To help find the galaxy, look left of Andromeda and Pisces, above Aries. If you can find M31, you are almost there. From my latitude in the Northern Hemisphere, M33 rises high overhead in the months of September-November. Use the star map from Sky and Telescope below to help you find it. Through long exposure photography, we can see that this galaxy is full of hydrogen gas. 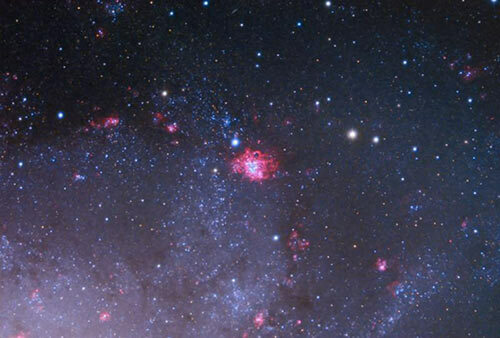 These are the pink areas seen throughout the spiral arms in the galaxy. A camera modified for astrophotography makes a big difference when capturing hydrogen regions. These reds and pinks will show up much brighter in a camera with its stock IR cut filter removed. Capturing narrowband data in the H-Alpha wavelength will brighten these areas even more. The image I shared earlier in the post went through several stages of image processing. Have a look at the original image below. The reason the sky is an ugly yellow-red color is that I shoot through heavy light pollution in the center of my city. This is what you can expect a single exposure of a deep sky object to look like from the city. I’ll need to balance the colors and remove gradients to pull this galaxy out of a washed out sky. I’ll discuss the details of processing the image further down the page. For this image, I used an IDAS LPS EOS clip-in filter to reduce targeted wavelengths of artificial light from the city. If you are having trouble finding this filter online, I suggest checking out the Optolong L-Pro filter. This is an excellent choice for broad-spectrum targets such as galaxies. In December 2018, I photographed the M33 galaxy using a narrowband filter thats isolates light emitted in the Ha wavelength. This camera filter allowed me to better showcase the intense clusters of nebulae in the galaxy, including NGC 604. To create the image below, I carefully blended the Ha details into my existing full color RGB image taken with a DSLR. To capture the Triangulum galaxy in Ha, I used a ZWO ASI294MC Pro camera through a Sky-Watcher Esprit 100 ED APO telescope. The filter used was the STC Astro Duo-Narrowband (Ha + OIII). For the photo of Messier 33 on this page, I used an Explore Scientific ED80 refractor telescope. 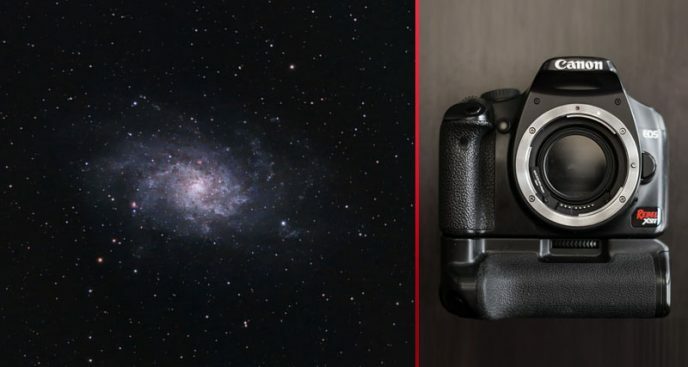 The focal length of this telescope (480mm) is well suited for the Triangulum Galaxy because it is a large galaxy, and a narrow field of view may not be able to capture the entire object. 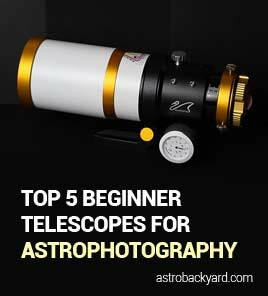 I often recommend this specific type of telescope to beginners because of my positive experience with it. This instrument has produced consistent results on a nightly basis from an astrophotography perspective. Another great choice to consider at this focal length is the William Optics Zenithstar 73. This apochromatic refractor uses FPL-53 glass to create images with incredible contrast and color correction. Back in September of 2015, I spent a number of clear nights focused on this galaxy. From my latitude in the Northern hemisphere, the Triangulum Galaxy rises high into the sky in the Fall. This is a prime location for imaging, as it is as far away from ground-based atmospheric disturbances as possible. I can also collect a lot of signal (light) on this target because it is free from obstructions like the roof of my house, and surrounding trees. 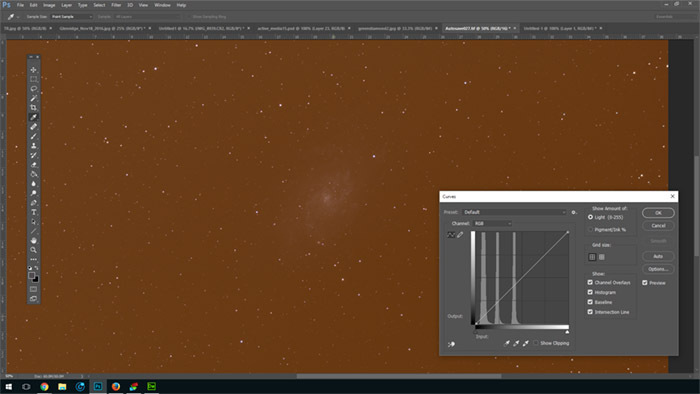 As with most astrophotography targets, the real challenge is in the image processing. Processing images of galaxies are quite different than most nebulae. The isolation of the galaxy amongst a black sea of space helps it really stand out when imaged. The tough part about processing M33 is the overall low surface brightness of the galaxy. My original stacked image had a horrible gradient due to the poor sky conditions I shot in. 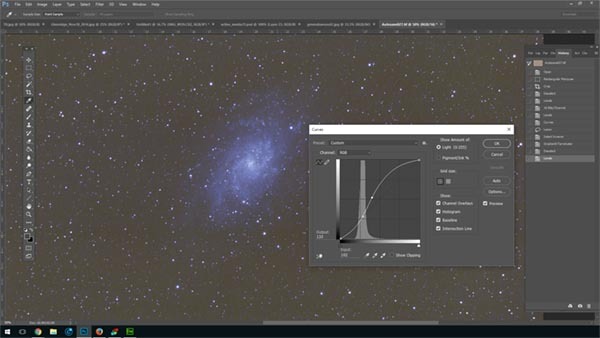 This was easily removed in Adobe Photoshop using a popular method of gradient removal for astrophotography. You can watch my image processing tutorial on removing gradients in Photoshop on YouTube. The capturing process went smoothly. I used BackyardEOS to control my modified Canon 450D. 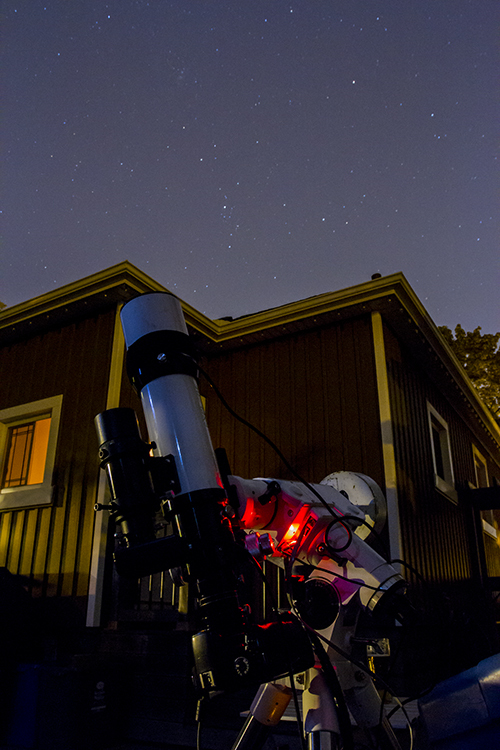 Autoguiding was used via the Orion Mini 50mm and Meade DSI Pro II combination riding on my Sky-Watcher HEQ5. For complete details of my astrophotography equipment, click here.